Flipkart Offer: The e-commerce firm said the move will enable millions of creditworthy yet underserved customers who the traditional banks are not able to serve/underwrite credit for. Flipkart offer: The festive season is near and you may have planned to buy a number of products. Money, of course, is always a problem. The situation, is proverbially, tight. However, this season, you may not have to worry a lot about the availability of money if you plan to buy stuff from Flipkart. After introducing ‘Buy Now Pay Later’ and Debit card EMI, Flipkart has introduced a new payment option ‘Cardless Credit’ which will not only provide a customer with up to Rs 60,000 credit line but also the options to either 'Pay Later next month' or 'EMIs of 3-12 months'. This is a continuation of Flipkart’s fintech journey which started with ‘Buy Now Pay Later’ and has helped customers get a convenient and worry-free shopping experience, said the Flipkart. Flipkart is gearing up for its Big Billion Days sale and it wants more and more customers on board this year. 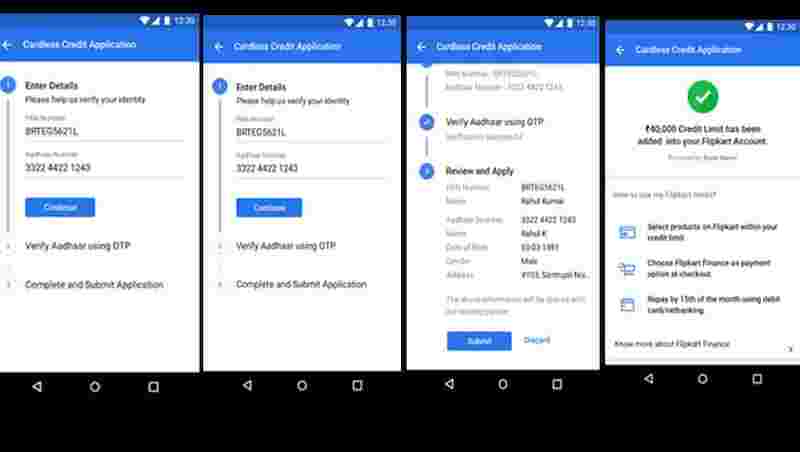 "Flipkart is introducing cardless credit as a customer focussed initiative that will simplify access to credit in real time while simplifying credit assessment and application process. Customers will be able to get instant credit which they can use to make purchases on Flipkart," it said. The e-commerce firm said the move will enable millions of creditworthy yet underserved customers who the traditional banks are not able to serve/underwrite credit for. "Cardless credit is a step in the direction to make e-commerce more inclusive and help customers with small ticket credit line while they make a purchase at Flipkart," it added. Ravi Garikipati, Senior VP and head of Fintech, Flipkart added that the move is also aimed at filling the purchasing power gap. "Cardless credit comes into existence as we understand that close to 45 million customers on Flipkart do not have access to credit, not that they are not entitled to. Amongst consumers, there could be a gap in terms of purchasing power but the gap is not in ambition and quality that they want to own. The challenge is of affordability and that is what we are trying to solve," said Garikipati. He added that cardless credit will have potential customers including the emerging middle class mobile active borrowers who do not have access to credit cards or credit limits. Who will get the instant credit? Flipkart will check a customers’ past shopping behaviour. If you are a constant buyer, it is more likely that you will be eligible for the instant credit.